Our creative batik artists never run out of ideas. Come and see how we process batik from the white fabric into a finished batik product. You will appreciate more when you know how we process our batik. We care about what we produce. We care about our environment. We care about your requirement. Note: We can make batik from 100% natural products, e.g. : cotton, rayon, crinkle, silk, linen, from various thickness and textures. There is no predetermined beauty only BEAUTY exist !!! 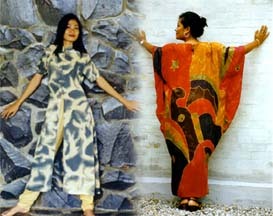 We produce garment made of BATIK or PRINTED material. Our special collection for the BIG SIZES have been successfully accepted throughout Europe. We are now ready to deal with you who are in the USA, Canada, Japan, Africa, Australia, and the rest of the GLOBAL.